Wheelersburg’s Kaylee Darnell scored 13 points and grabbed eight rebounds in Thursday’s 35-25 win over South Webster. Freshman Ellie Kallner drives through traffic during Wheelersburg’s 35-25 win over South Webster Thursday. South Webster’s Bailey Cox drives past Wheelersburg’s Karlie Estep during Thursday’s 35-25 loss. Wheelersburg senior Abbie Kallner boxes out a defender during Thursday’s 35-25 conference-clinching win over South Webster. 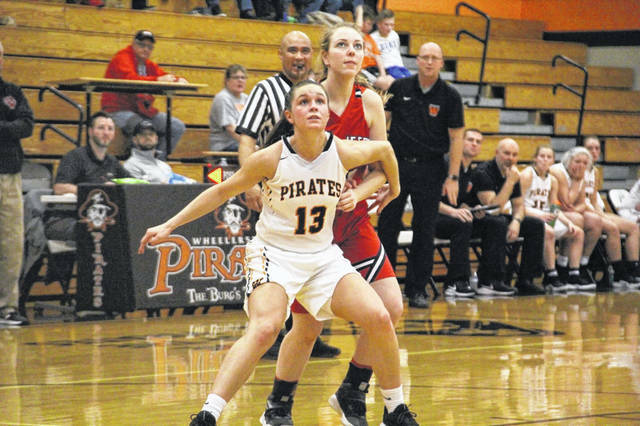 WHEELERSBURG — At the end of Thursday night’s third quarter, Wheelersburg’s Kaylee Darnell drove through the lane and beat the buzzer with a floater. And that was the last time the Pirates scored. If you would’ve told Pirates coach Dusty Spradlin that the last sentence you just read was going to be a reality before the game, he may have acquired an immediate dose of anxiety. Indeed, Spradlin’s Pirates failed to score throughout the final eight minutes. But he can breathe a little easier with a 35-25 win over South Webster officially in the books. When you can play superb defense and control ball possession with a 17-point lead, why score? 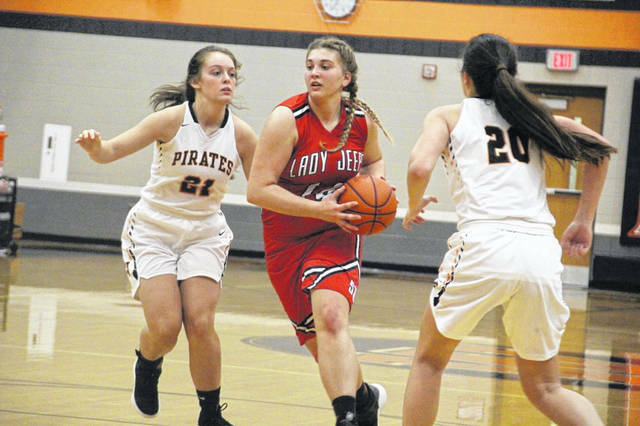 The victory seals the deal on an outright Southern Ohio Conference II title, a feat many said the Pirates (18-4, 13-1 SOC II) weren’t capable of achieving early in the year. South Webster’s Bri Claxon gave the Jeeps their only lead of the night with 4:48 left in the first quarter. However, that was quickly erased when Abbie Kallner dialed long distance to put the Pirates on top at 6-4. ‘Burg then used a 7-0 run to eventually take a 13-8 edge into the second. In the second, the Jeeps (8-13, 5-9 SOC II) continued to hang around. Kaylee Darnell nailed a 3 to extend Wheelersburg’s edge to 16-11 but South Webster answered with a 4-0 burst, cutting the lead to 16-15. Just before halftime, Darnell hit another 3, sending the game into the break at 19-15. In the third, the Pirates started to pull away. Alaina Keeney hit a 3 to begin the scoring before Kallner followed suit, making it 25-15. With 4:28 left, Ellie Kallner scored her only three points of the night, pushing the edge to 28-17. The Pirates then pieced together a 7-1 run to end the sequence, taking a 35-18 lead into the fourth. From there, defense and ball possession delivered a title-clinching win. Abbie Kallner led all scorers with 15 points while Darnell followed with 13 of her own alongside a game-high eight rebounds and three assists. Keeney finished with five points, six rebounds and two assists, and Ellie Kallner ended the evening with three points and seven rebounds. South Webster was led by Maddie Cook with nine points and six rebounds while Bri Claxon added eight points and seven rebounds. Kenzie Hornikel also helped out with two points and seven boards. Both teams now looks towards impending first-round tournament matchups. Wheelersburg will take on Adena on Feb. 14 while South Webster faces Piketon on Feb. 11. Both games are Division III sectional semifinals and will take place at Valley High School. South Webster: 10-31 FG, 4-8 FT, 1-6 3pt. (Cook 1), 23 rebounds (Hornikel 7), 23 turnovers, 1 assist (Hornikel 1). Scoring: Cook 9, Claxon 8, Montgomery 2, Hornikel 2, Maloney 2, Cox 2. Wheelersburg: 13-47 FG, 2-5 FT, 7-24 3pt. (A. Kallner 3), 24 rebounds (Darnell 8), 13 turnovers, 9 assists (Darnell 3). Scoring: A. Kallner 15, Darnell 13, Keeney 5, E. Kallner 3, Irwin 1.
https://www.portsmouth-dailytimes.com/wp-content/uploads/sites/28/2019/02/web1_thumbnail_Darnell.jpgWheelersburg’s Kaylee Darnell scored 13 points and grabbed eight rebounds in Thursday’s 35-25 win over South Webster. 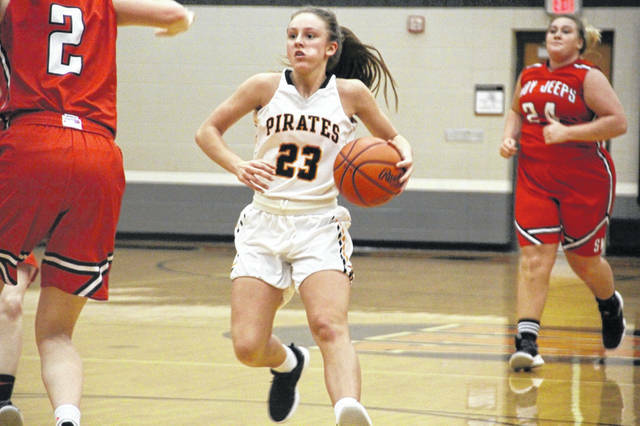 https://www.portsmouth-dailytimes.com/wp-content/uploads/sites/28/2019/02/web1_thumbnail_EKallner.jpgFreshman Ellie Kallner drives through traffic during Wheelersburg’s 35-25 win over South Webster Thursday. 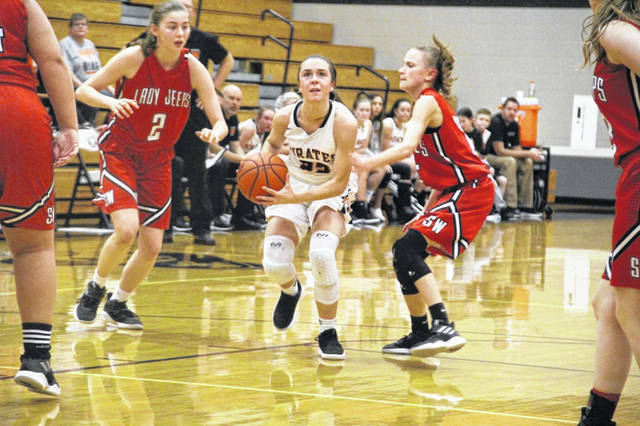 https://www.portsmouth-dailytimes.com/wp-content/uploads/sites/28/2019/02/web1_thumbnail_Cox.jpgSouth Webster’s Bailey Cox drives past Wheelersburg’s Karlie Estep during Thursday’s 35-25 loss. https://www.portsmouth-dailytimes.com/wp-content/uploads/sites/28/2019/02/web1_thumbnail_Kallner.jpgWheelersburg senior Abbie Kallner boxes out a defender during Thursday’s 35-25 conference-clinching win over South Webster.